We were out and got home with little time to make dinner. My wife says she doesn't like celery but when I bought a nice organic bunch at a great price, she said she'd try it, including an idea I had to make a cream of celery soup. I wanted to get dinner ready literally in 20m or so, so threw together a simple soup. Here is what I did. I simply blended all the ingredients. Because I use a high power Vitamix, I just let it continue to run for about 2 minutes till the soup was hot but, alternatively, the blended soup could simply be heated stovetop. I served with some tempeh, cooked with no oil on a cast iron pan. I was surprised at how good the soup was! It was easy to make and had a rich, creamy, flavor. Alas, my wife (and, to some extent, my daughter) really does not like celery and did not like the soup. This was, unfortunately, one of the (luckily very rare - I think in the dozen or so years I've known her, there have been three meals she hasn't liked) meals of mine that she didn't like. I guess for myself, I need to make this soup again. It would be fun to enhance it maybe with dill and maybe a sprinkling of celery seat when served (I used to commonly use celery seed long ago). Mixing some cooked potato could be nice but I really liked the thick consistency that I got with the almond milk creamer and potato might make the soup too thick; perhaps some chunks of potato could be served intact in the soup. We had been out of a favorite bean of mine, but my wife picked some up yesterday, Giant Peruvian lima beans. My wife doesn't like celery but I found a great deal on organic celery and she agreed to try cooked celery. I didn't soak the beans overnight so rinsed them then let them sit in ample (maybe 3 cups) boiling water for a half hour. I also added the rice to soak with the beans. I was out but had my wife rinse the beans and rice again. I generally find that brown rice and beans cook in a 1:3 ratio (3 times as much water as rice and beans combined) for 30m, so I had her add 6 cups of water to the rice and beans, as well as the cauliflower, chard, garlic, and bouillon cube, and cook in my Instant Pot pressure cooker for 30m. After the cooking was done, I waited a few minutes and gently released pressure, then added the carrot, celery, and ginger, and cooked for 2 more minutes. When I was ready to serve, I opened the pot slowly, and added onion, salt, turmeric, amchoor, and lime juice. I also made a tomato and olive salad with ume plum vinegar, salt, and oregano. Surprisingly, there was a bit too much liquid in the intermediate dish; I removed maybe 3/4 cup of liquid before the second short cooking. Dinner was good and even my daughter, who doesn't always like these beans, enjoyed it. It was a bit softer than I'd like it to be, deprived of more texture. I have to try making rice and bean combined dishes with maybe a ratio of 1 part rice and beans to 2 1/2 parts or possibly 2 parts water. This may depend on bean, though. I'll stick with 1:3 for now and see how it turns out next time. 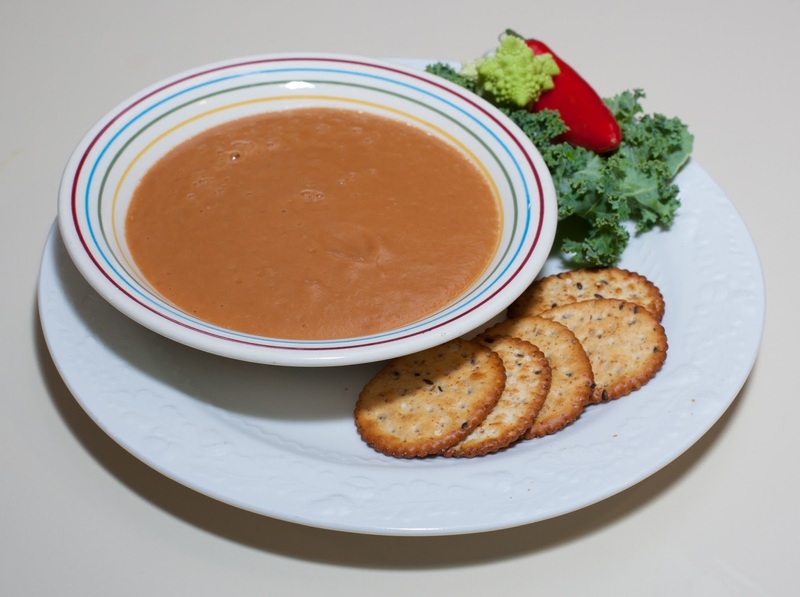 My daughter requested tomato soup and I found a nice creamy Tuscan tomato white bean soup recipe, made creamy by using beans. I didn't follow the recipe, but used the idea of blending beans into a tomato soup. It takes navy beans 25-30m to cook unsoaked and 20-25 soaked, with just enough water to cover. Here is what I did. I rinsed the beans then put them into my Instant Pot pressure cooker along with just enough water to cover them, and cooked for 30m. While the beans were cooking, I added all of the remaining ingredients, except the tomato, to my Vitamix blender. After the cooking was done, I waited a few minutes and gently released pressure, then added the cooked beans to the blender. I blended on low, ramping up to medium for maybe half a minute till ingredients were homogenized, then blended on high till the soup was steaming hot (about 3 minutes). I added the fresh tomato and pulse blended briefly, making sure there were chunks of tomato left, then served. Dinner was good. I thought that the soup was a bit tangy, but it was just right with crumbled crackers. My wife really enjoyed the soup; my daughter liked it but wished that it had less garlic. I love this idea of blending beans into a soup for creaminess. I've made other creamy soups, such as carrot, but have used cashew, which adds fat and expense. 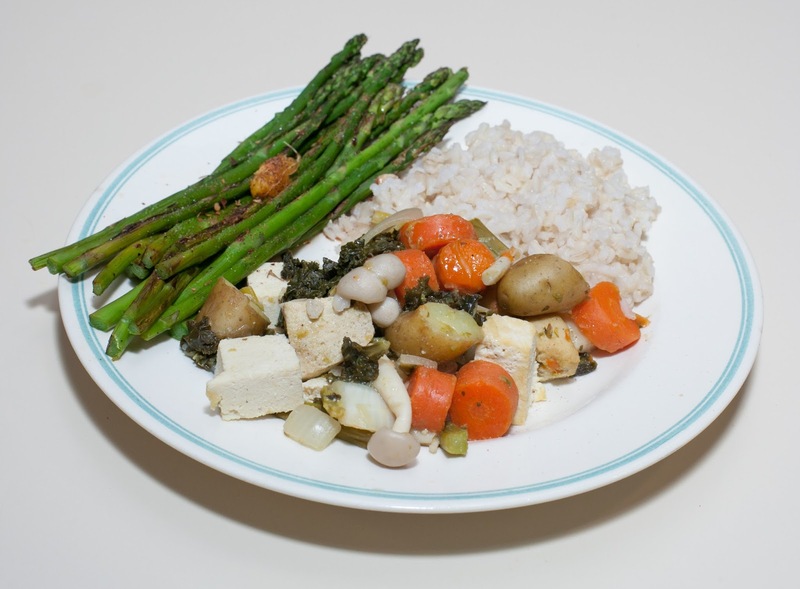 Tofu is another alternative, but my wife has problems digesting tofu. I'd like to try similar soups in the future. I think that I could improve this one with half as much garlic and maybe more tomato. If we had plum tomatoes, I'd remove the seeds and use them. More - maybe even double the amount - of tomato paste would benefit the soup. I'm so glad to have experimented with a bean soup where the bean is not even the star of the soup, but a thickener that brings great nutrition to the dish. 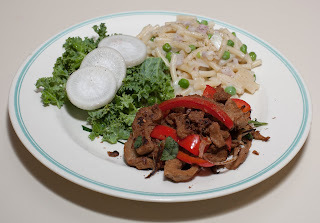 It was just kiddo and me for dinner today, and I had to get dinner together quickly, so I made a simple boxed vegan macaroni and "cheese" (Earth Balance white) cooked with peas. I also cooked, with no oil, seitan, shallot, and bell pepper, and served with a little citrus juice and, on my portion, jerk seasoning. Dinner was good. I wanted to make a dish with adzuki beans; they are easily prepared pressure cooked for 20-25m if unsoaked and only 10-15m if soaked, cooked with enough water to just cover. I love Meyer lemons and recently a local cooperative store, Weaver Street Market, has had organic Meyers regularly in stock. I wondered what it would be like to cook with pieces of these sweet lemons. Here is what I did. I rinsed a cup of adzuki beans then put ample boiling water over them and let them sit for about 5 hours. I was out but had my wife rinse the beans and put them in the Instant Pot pressure cooker with just enough water to cover them and a bouillon cube, and cook for 12m. After the cooking was done, I waited a few minutes and gently released pressure. It turns out that my wife added extra water, which I drained. The beans were good and done, though a bit firm. I added the carrot, garlic, basil, ginger, kale, and lemon, then cooked for 2 more minutes. When I was ready to serve, I opened the pot slowly, and added shallot, salt, and turmeric. I had recently purchased a nice mix of "organic super grains" from Whole Foods Market, which consists of white quinoa, millet, red quinoa, and buckwheat (ingredients listed in that order of decreasing volume). It cooks in a 1 part grain to 2 part water ratio over a 16-20m simmer. I made that, as well as a fun salad of tomato chunks, olive, and Ume plum (other vinegars would do, too) vinegar, plus a bit of salt. Dinner was very nice! I was so pleased with how nicely Meyer lemons cook in a dish like this. It's nice to have adzuki beans after a long time - they taste a little like black beans, but are less dense and cook faster and with less water. The salad was excellent! I should make this salad reasonably regularly when good tomatoes are available, and the stores seem to just be ramping up with good tomatoes. I am quite happy with the texture, taste, and, of course, nutrition of the "super grains" mix and should either keep buying this combination or make this or other similar mixes. I want to keep exploring Meyer lemons in cooking. The skin by itself is nice, as is the whole lemon. 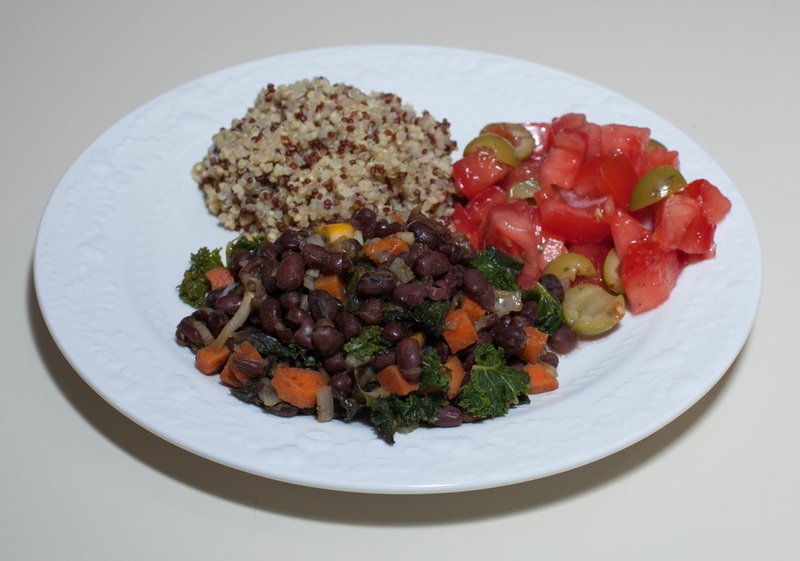 I should cook more adzuki bean dishes - they're easy and fast to cook. My wife had plans so I made dinner for just my vegan macaroni and cheese-loving daughter and me. 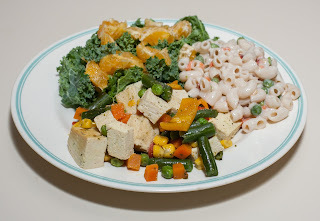 There is a new Daiya brand white cheddar-style "cheezy mac" with vegetables that I thought I would try; I also made some tofu and vegetables, cooked for a few minutes (2, as I recall) in my pressure cooker. My daughter wanted a massaged kale and citrus salad, which sounded great. Everything was very tasty! We think that this Daiya macaroni and "cheese" may be the best boxed "mac and cheese" that we've had. It was luscious, creamy, and tasty. I started soaking some navy beans, which I've not cooked with in some time, this morning. 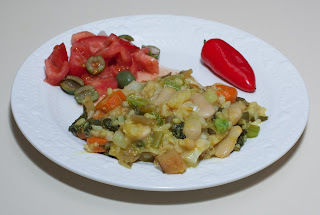 I recently tried buying frozen artichoke hearts, and had been thinking of cooking with artichoke hearts recently, and came up with the idea of making a dish with beans and artichoke hearts. I've been enjoying getting consistently excellent results in making my own vegan yogurt. A friend wanted to pick some up and I invited him to stay for dinner. Here is what I did. I rinsed and soaked the beans in ample water for about nine hours. I rinsed the beans again and put them, along with just enough water to cover them and a vegan bouillon cube, into my Instant Pot pressure cooker and cooked for 25m. While the beans were underway, I prepared vegetables (see below) and rice. I used germinated brown rice that I had soaked for a few hours then cooked in my Zorirushi rice cooker with the brown rice program in a ratio of 1 part rice to 2 parts water. For the vegetables, I prepared them waterlessly in my large Saladmaster stock pan by putting in the onion, tomatillas, artichoke hearts, broccoli, and carrot, covering, and heating on medium heat till the vapor valve started clicking, then reducing the heat to low till the clicking stopped and cooking for 20 or more minutes. After the beans were done, I waited a few minutes and gently released pressure, then mixed the beans into my vegetables, adding salt, basil, and tangerine juice. Dinner came out well; my friend particularly seemed to enjoy the meal, as did my daughter, wife, and me. The artichokes combined well with the beans. A little ginger and jalapeno might have been nice in the main dish. I have been thinking of making a bean and rice soup, perhaps inspired by memories of my Mom's tomato and rice soup that she would make (I should try that, too). Here is what I did. I soaked the beans and rice, combined, for about 8 hours in ample water, rinsing before and after. After a final rinse, I put the drained rice and beans in my Instant Pot pressure cooker, added the ginger, onion, kale, cumin, water, bouillon cube, and lemon juice (and lemon pieces) and cooked for 30m (I just pressed the Instant Pot's "Soup" button). After the cooking was done, I waited a few minutes and gently released pressure, then mixed in salt and garlic powder, and served. 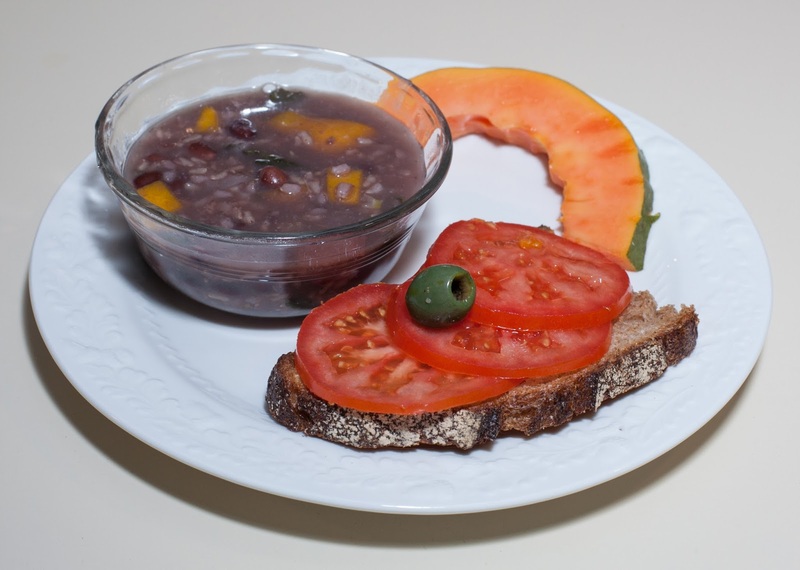 I served the soup simply with a luscious slice of papaya and whole grain toast topped with tomato. Dinner was good. Everybody liked the soup, but I think it could have been a bit more flavorful. I love including Meyer lemon peel in my dishes! I should have made the broth more substantive, perhaps with a little miso, but certainly with more vegetables, like small (1/4"?) cubes of carrot and garlic, and perhaps some herbs like tarragon or dill. A little bit of heat, like jalapeno or hot sauce, might be nice. The rice worked well in the soup. My wife put the beans and rice to soak initially and picked out brown Basmati rice; it was good, but regular brown rice, which I intended, would be thicker and, I think, better. 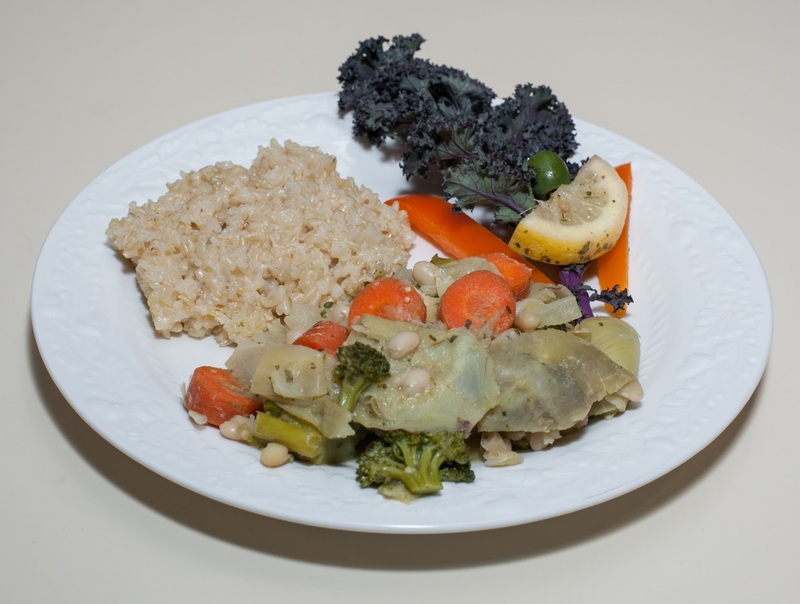 I might try a beans and barley soup sometime, as a thicker grain may work even better than rice. On the cruise last week, I was surprised when a creamy asparagus soup was served and - my daughter liked it! She had until then always said she didn't like asparagus. 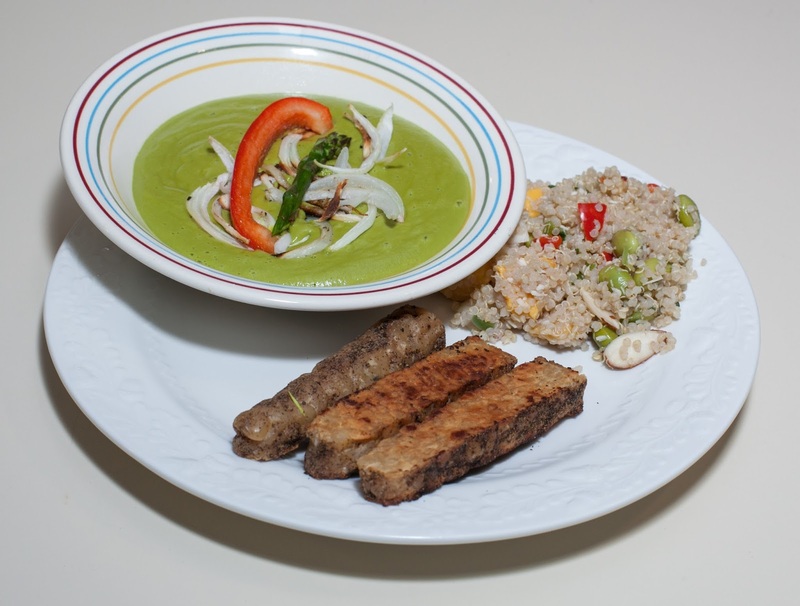 Back in 2010, I had made a version of a published asparagus soup recipe and decided to try coming up with another version of a creamy asparagus. Here is what I did. On a cast iron pan at medium heat with no added oil, I gently cooked the asparagus and onion, stirring occasionally, for maybe 7-10 minutes till softened and slightly carmelized. I put all of the ingredients into my VitaMix blender and blended. I tried it once homogenized and tweaked the seasoning (in particular, I originally had just squeezed the Meyer lemon but was delighted to find that the peel is not bitter, so included it), then let it go on high for several minutes till hot (this is a nice feature of my VitaMix; for other blenders, it may be worth homogenizing and then putting the soup into a pan to heat). Though it's expensive, we like, as I described in early January when we first tried it, Smiling Hara brand smoked salt and pepper peanut "hempeh". We bought some more this week, and I simply sliced it and sauteed it on the same cast iron pan after the asparagus was done. Some prepared quinoa with coconut and mango that I had purchased already prepared from Whole Foods Market completed the meal. The soup was good but I didn't like a slight bitter flavor that I think the kale stems contributed. We should buy this "hempeh" more often! I am so happy about the revelation of including Meyer lemon skins in cooking; now that I have also found an organic source (Weaver Street Market cooperative), I can better justify the higher cost than (organic or conventional) lime or lemon as the peel is "appealing" :-) . In the Food for Life program that I teach for, we recommend 10% fat calories, with, as a rule of thumb, no one dish having more than about 3g of fat. 1/2 cup of cashews has about 30g of fat; we had some leftovers, so let's call it about 8g of fat per our three servings, so I won't call this even an almost-no-added-fat meal. I should try another batch of soup, but decrease the cashew (to reduce fat - the soup was quite thick and could have been thinner), maybe add a little "heat" like jalapeno (for batches not for my daughter), and omit kale stems. I am excited about Meyer lemon peel! 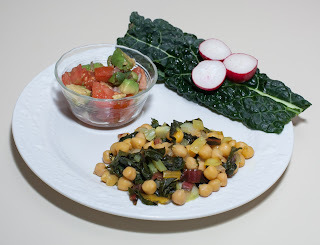 I didn't write today's recipe down but was excited about a new way of preparing chickpeas. Rather than pressure cook them, I had heard on the recent vegan cruise that they come out great cooked on low heat in a Saladmaster stock pan with water just enough to cover the chickpeas. I did just that; I soaked chickpeas for 5 1/2 hours then cooked on low heat, covered, for about 45m. These were perhaps the best chickpeas that I've had - juicy and plump. Yum!